Roleplay sample: Tatakai Sento sat on the second floor railing of the dorm. His feet interlaced through the bars as he hunched ofer shifting through his deck. It was not the best deck, not now anyway, but at one point it was quite efficient. Heavy hitting, for every single one of his monsters had an attack power above one thousand nine hundred and a level of four or less. Even his spells boosted the power of those creatures by at least seven hundred. The traps perfect for when the chips were down, draining the opponents attack, negating it, sending right back at them, or destroying his opponents monsters out right. 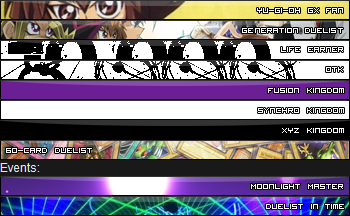 The deck was simple with no fusions, syncros, tuners, xyz's, nor ritual summons. It was a beat stick kind of strategy, one that was out dated now a days. That would not discourage Tatakai though after all his very name meant fight and he always dueled to win though you would not think it with the loosing streak he had been on. Letting out a soft sigh as he worked the sixty cards into a deck he could not help but wonder if he should just toss the cards he had and start a new. Unleashing his feet as he slid the sixty cards back into their container he would lean back, rolling off the rail he would flip to land on his feet. "Forget about it. It's not a bad deck, just a bit ol' school." Tatakai turned and headed back to his room he could not help but ponder what twist fate would bring him tomorrow. Another loss or an end to this loosing streak. With a nod to his room mates he would take off his shirt and shoes before he slid into bed hoping to fall into the comfort of sleep, that is unless his room mates had something to discuss. What no one approved this yet? ?